You can also access unlimited Facebook using your mobile phone with TM ASTIGFB10 for P10 valid for 1 day. By just texting the keyword ASTIGFB10 then wait for the confirmation message sent to your mobile, once you received the confirmation you can now go to m.facebook.com using your mobile phone browser. Some keywords related to ASTIGFB10 are ASTIGFB STOP, HELP and STATUS. 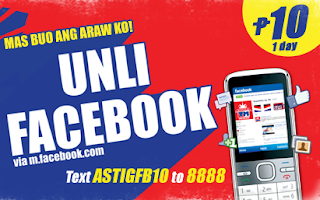 See post below on how to register TM unli Facebook using ASTIGFB 10. You may also read this post Globe Unli Facebook SUPERFB10, Smart Unli Facebook 10 Mobile Promo and Sun FB10 Unli Facebook. Promo ends on December 31, 2012. You may visit TM website for more details and availability of this promo.